It was my first time sitting in the ox cart. Actually it’s difficult to climb up high since begining. I was pulled up by the cart driver and sit beside him in a front row with guide. Chitawan national park is the low flood plain and be the head upstream part of Conga river to India. The Rapti river, tributary of Conga is the border line of the Chitwan National Park. There are 4-5 rivers confluence in this low land of Nepal. As Nepal locates the highest peak over +8000 m.MSL it also diverse to the very low land of +60 m.MSL in Terai flood plain. The weather is quite like troical in Southeast Asia. In April, it’s was summer, just after first rainfall, new leaves was springing up to bright green. This location is on the another side of Rapti river located the village ot “Taru” people. It maybe flood plain along river. I still see people cutting more grass for buffaloes though there were wide filed of green grass, so the local guide told us that if cows or buffaloes eat grass less than ….. they will not give milk. 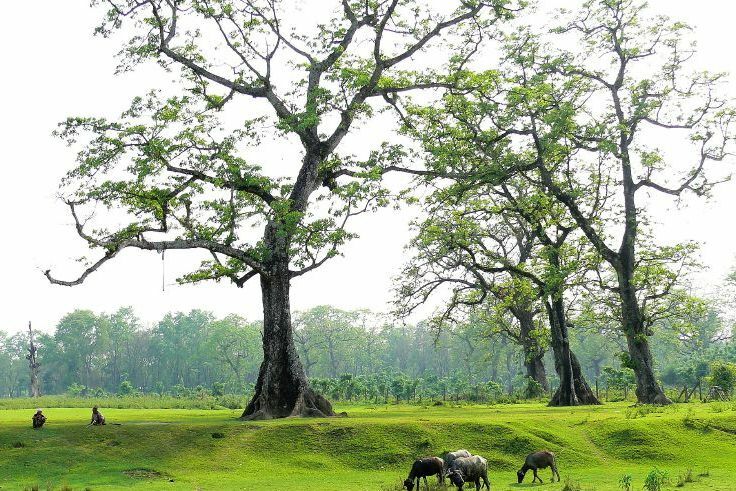 It’s low land and really fertile with wild life, forest and nearby people live well with nature. Even one horn Rhinoes, unique in Nepal cross the Rapti river staying between Chitwan National Park ad the local community forest. They dont use border line humna make if they still live in peace with no harm. Terai low land is producing food for Nepal. I love that local people have their part with tourism. I enjoyed ox cart, canoeing, elephant riding, village tour, Taru tribal dance around campfire all involved local people with tourism.